Clothing giant will no longer sell item featuring controversial slogan. 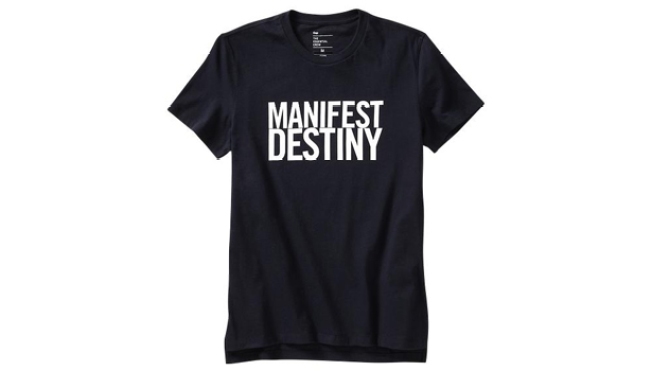 A Gap t-shirt emblazoned with the words "Manifest Destiny" will no longer be sold by the mass clothing retailer following complaints from Native Americans and the setting up of a petition at Change.org. “Manifest Destiny” described the 19th century belief that settler colonizers to the United States were divinely destined to spread west across the North American continent, regardless of the Indigenous peoples already occupying those areas. Activists reacted strongly to the wording on the item (offered through a partnership with GQ and guest designer Mark McNairy) by setting up a petition at Change.org asking for the t-shirt be discontinued and an apology issued. Over 4,700 people supported the petition at publication time. Indian Country reprinted a letter to the Gap from Native American activist and actress Renee Roman Nose which reads: It is with great sadness that I notify you I will not be shopping at your store until you remove the “Manifest Destiny” t-shirts available at your stores. Manifest Destiny was the catch phrase which led to the genocide of millions of my people, millions of Indigenous people throughout this country. I am also inviting the more than 1700 people on my Facebook page to boycott your stores and inviting them to shop with their conscience. Gap responded Tuesday by removing the T-shirt for sale. In an email to Salon.com, the company stated that the t-shirt would no longer be "sold in Gap stores or online. We value all customer feedback, and wish to emphasize that our intention was not to offend anyone." Earlier, the shirt’s designer, Mark McNairy, took to Twitter with “Manifest Destiny! Survival of the Fittest!” That has since been deleted and an apology issued. "I am sorry for survival of the fittest comment. It hurt me deeply to be called a racist as that is not me. I reacted without thinking," tweeted @mmcnairy Tuesday afternoon.